The recent, ongoing transformation of Vancouver’s Chinatown has been happening at a very rapid pace. A series of new condo towers are under construction and a list of new businesses are opening up. Not to mention the growing presence of the visual arts including artist studio space, artist run centres, commercial galleries and your friendly neighbourhood public gallery: Centre A. How are we to consider this process? How does the incoming community relate to and have relationship with the long established community of the neighbourhood? In some instances new comers embrace the old, retaining legacy signage or seeking other means to place a volume dial of their cultural expression. Others open up with distinct, sharply branded aesthetics that make no nod to the existing neighbourhood’s past or present. In a capitalist society where the right to enter one space or another is dependent on little more than one’s ability to pay rent, are there rites of passage/entry, gestures and postures that should be adopted to pay respect? As a commercial rent payer and a public art institution recently moved to Chinatown, Centre A is interested, on both institutional and personal levels, in ways one takes on a posture of gratitude and respect especially in instances where the act of being given to isn’t so direct and the right to receive isn’t necessarily one’s own. A reflection on the two distinct ways to say “thank you” in Cantonese m’goi and do jeh, this exhibition considers rites of passage and gratitude in the contexts of urban transformation in Vancouver’s Chinatown, and, the psycho-social processing of inheritance, loss and change. In so being, M’goi/Do Jeh: Sites, Rites and Gratitude’s participants, community engaged poets Lydia Kwa and Kathryn Gwun-Yeen Lennon as well as neighbourhood elder Mrs. Chang, help Centre A in its quest to discover its place in the geographic and cultural space it recently moved into. Curated by Kathryn Gwun-Yeen Lennon 姚君妍, with language instruction by Zoe Lam 林慧雯. 7 classes: $40 for Centre A members, $60 for non-members, $9 drop-in. Considerations can be made for low-income participants. For the duration of the exhibition, this space will serve as a pop-up resource centre, inviting visitors to participate in and imagine how a community space shared by groups engaged with cultural knowledge and community development might function. If you’d like to meet or work in the space, email kathrynlennon [at] gmail.com. Sorry to those of you who replied to the call but can’t make it but we’ll post the outcomes of the meeting on this blog. If you know anyone who might be interested in joining us, please let them know about the meeting. If you’re interested in getting on the email list, please contact Kathy at hosunhingproject [at] gmail.com. 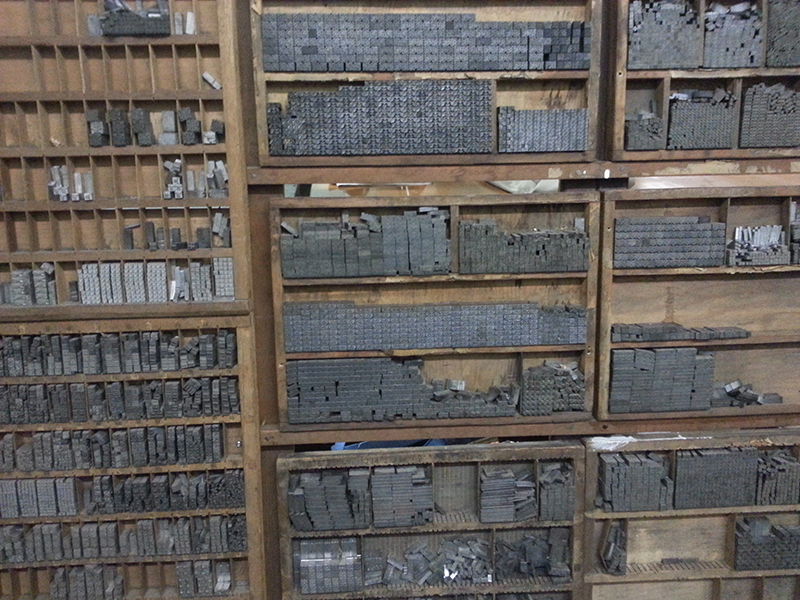 Also, for those interested in the joining the Vancouver Letterpress League, please check out www.letterpressleague.ca. Looking forward to meeting whoever can make it on the weekend! 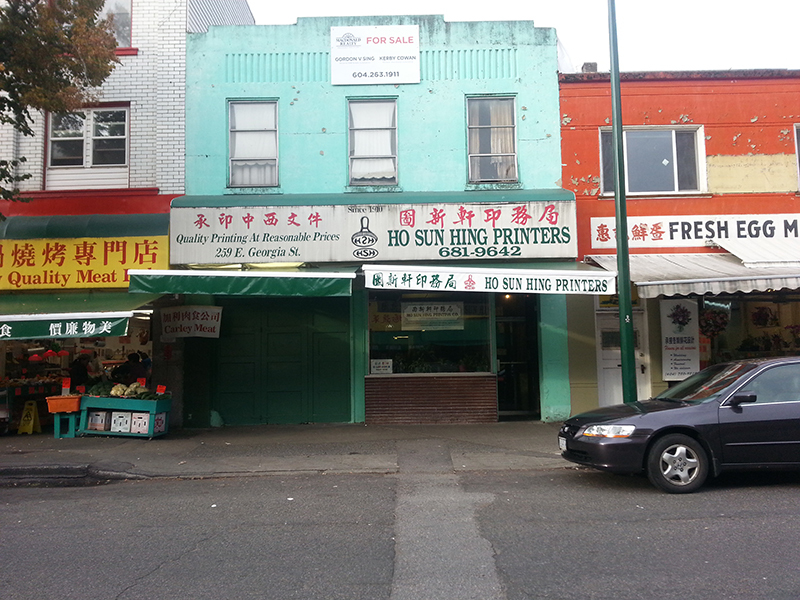 As some of you already know, Ho Sun Hing Printers on East Georgia in Vancouver’s Chinatown, the oldest Chinese print shop in Canada, will be closing down at the end of this year. This is a call to those of you interested in saving what we can for either / both the Chinese Canadian community (and for all of us to know Vancouver’s history! ), and for the possibility of starting something like a community print shop. How many of us have dreamed of access to a letterpress for our art / book projects? Wouldn’t it be great if we could create an artspace for this to be shared? Maybe there still is some way to do something with the items in this shop, which is over 100 years old! There are photos of the shop online on Peter Chow’s site (but his email form doesn’t work so if you know him, maybe you can let him know about this project) – note that some of this type and equipment has already been sold. And luckily, Julia Kwan has made a documentary (produced by the National Film Board) about the shop so it has been preserved in this way but the film won’t be out until next year. I believe there were 4 or 5 presses left (3 of them are letterpresses), some of the lead type, including 1 set of Chinese characters (8000+ per set), and 3 machines that create the lead type itself (two that make English letters and one that makes Chinese characters – these machines are very hard to find these days) – along with a horizontal camera and the machinery for binding, cutting, furniture, etc. – everything a full print shop that does everything would need! It is truly incredible. I spoke with Norman, the son of Hilda who owns the shop, and he said that someone in Toronto had made and offer of $6000 for the 3 machines that make the lead type. Lydia Kwa, who is the person who told me about the shop in the first place (and she has created an amazing book using type from the shop! Email me if you’d like more info on her beautiful work! ), said that they would sell the presses for $1000 each ($1500 for the large one) but really, the family is just looking to clear the shop out by the end of the year and needs to sell as much of the contents as possible. Plus we would need to pay for moving everything (the presses probably weigh anywhere form 13,000 to 20,000 pounds) and possibly store things until the group decides how to proceed. So not sure how much money we’d need to raise in total yet. I’ve asked Norman for an inventory list and estimate of what he’s hoping to sell everything for so we will see what he sends us. And he knows that there is now a group of us trying to raise the funds. And a number of other organizations have the info but haven’t replied yet. But please share this info amongst your networks! If you’d like to get involved in any way, please contact Kathy at hosunhingproject [at] gmail.com. Our next step is to organize a meeting so that everyone that’s interested can try to figure out how to move forward!